WAT is the Ethiopian national dish. It is a hot spicy stew, which is served with injera. There are many varieties of wat e.g. chicken, beef, lamb, vegetable, lentil and ground split pea. All are stewed with a hot spice called berbere. The wat is served by placing it on top of the injera, which is served in a mesob (large basket tray).The food is eaten with the fingers by tearing off a piece of injera and dipping it in the wat. KITA is a traditional bread made from wheat flour, salt and water. It does not need fermentation time. 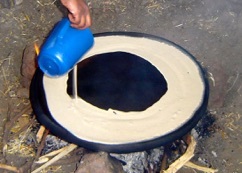 It is cooked on the large injera oven. It is best eaten fresh on the day it is made. TEJ is a mead-like drink made from honey. It usually comes in three strengths ranging from non- alcoholic to very alcoholic. The medium and strong varieties also include barley or maize and hops. The medium strength is a pleasant, slightly alcoholic drink. TELLA is a local beer. It comes in 3 types, ZILEL, which is made from barley, maize or sorgum, CORAFE, which is made from lightly roasted barley, and LIFTER, which is made from well roasted barley or sorgum and is darker in colour. They all contain hops. It is traditionally drunk on major religious festivals, saints’ days and weddings. 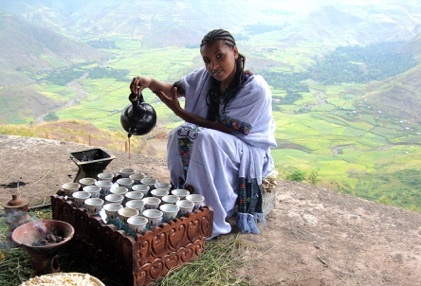 There is opportunity at Ben Abeba to sample all traditional food and drink. Injera and a selection of wats will be on the lunch and dinner menu every day. Tej and tella will be available at the bar. TEF is a member of the grass genus Eragrostis, or lovegrass. It is unique to Ethiopia. It grows in many areas, but is not an easy grain to harvest as the weight of the grain bends the stem to the ground. Fortunately for Ethiopians, who depend on Tef Injera as a staple food, it has a particularly high nutritional value. It contains two to three times the amount of iron of wheat or barley. It also has a higher content of Calcium and the other essential minerals. It contains 14% protein, 3% fat and 81% complex carbohydrates. Tef is the only grain to have symbiotic yeast. Like grapes, the yeast is on the grain and no yeast needs to be added in the preparation of Injera. BERBERE is made from dried red peppers, herbs, spices, dried onions, dried garlic and salt.